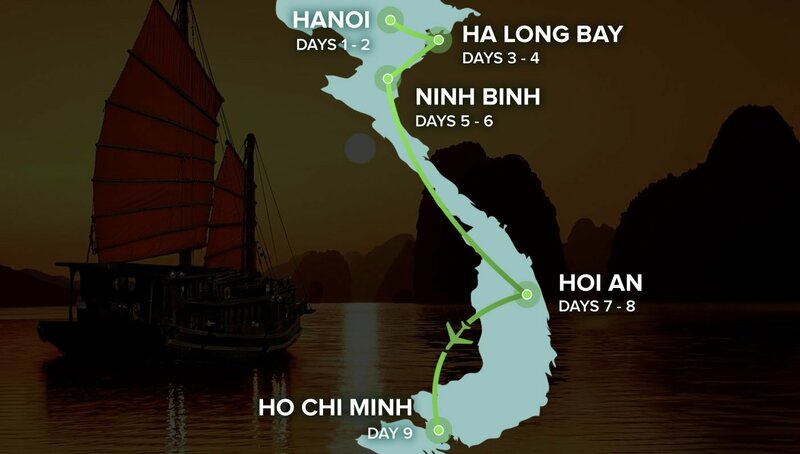 Cruise on a rickshaw through the crazy capital of Hanoi, meet the friendly locals, sample the delicious street food, discover the stunning Ha Long Bay on an overnight boat, go kayaking through caves and stay overnight on your own private island, learn to cook delicious Vietnamese food, experience a Local Homestay and more! Today we catch a short flight to Ho Chi Minh City and arrive early afternoon. Your adventure finishes today. We recommend adding an extra night with us in Ho Chi Minh City and flying out on day 10. Really good tour. Nathan up for a laugh and got the group talking, even as a big group. Highly recommend! Nathan really united the group, service from intro travel was really good. Nathan was friendly and happy everyday, also very helpfull. Sammy was an amazing tour guide. Always positive, very out going and she had fantastic knowledge to share of Vietnam. A true credit to Intro! The tour was great. Hannah was a great and experienced leader, the group was super nice, and the itinerary always kept us moving. Such a great tour, and Nathan made it for us!! Really enjoyed it and great value for money! !